Vegetarian creamy taco soup to warm you up during the cooler months with tons of Mexican flavors! This dreamy-creamy slow cooker taco soup is like a slow cooker tortilla soup and healthy chili recipe combined! The two is a marriage made in heaven?. Leftovers of this comforting soup can used as chili in tacos! It takes little time on the stove top or simmer in the slow cooker for richer flavors. Well, we have big news over here and no (mom) I am not pregnant?! We have been busy moving this past week and bought a new home in a new city… our family and Delightful Mom Food has a new headquarters!!!! It has been about a year in the making and I am overjoyed it has finally happened! So, you will have to forgive me for not posting in over a week! But let me say, boy have I missed getting on the blog and writing to you. I must really love what I do?! We are almost finished with the move. Chase started 1st grade yesterday at his new school and had a wonderful day making new friends. Curren stays home with me baking and cooking with a side of homeschooling and starts kindergarten next year. As far as moving, I have the kitchen “settled in” and ready to get new recipes going! The bedrooms are organized, and we are working on making a few built-in pieces of furniture for the family room and office. It really helps when your husband is a contractor!!! I envision, and he creates! Pretty happy I married that man, I sure will keep him around! He is also the foundation of this blog that keeps me going when I feel like I can’t keep going. It is always important to have that kind of accountability. With our move going on there have been a lot of nights where dinner just needs to be REALLY simple. I mean REALLY. With like, no dishes. During the month of packing I made this family favorite super easy taco soup and have been so excited to share it with you! 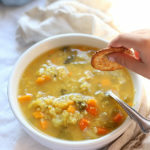 We are big Mexican food fans around here and just love this easy soup recipe made with a few delicious vegetarian ingredients and bold Mexican flavors! A vegetarian knock-off version of my Creamy Chicken Taco Chili Recipe that I made a few years ago for a vegetarian friend after she had a baby. She absolutely loved this creamy taco soup and it has only taken me three years later to get it on the blog! Better late than never, right?! Add your favorite garnishes such as fresh cilantro, avocado, sour cream, extra cheese and crumbled tortilla chips. Serve this creamy taco soup with fresh tortilla chips on the side for dipping. 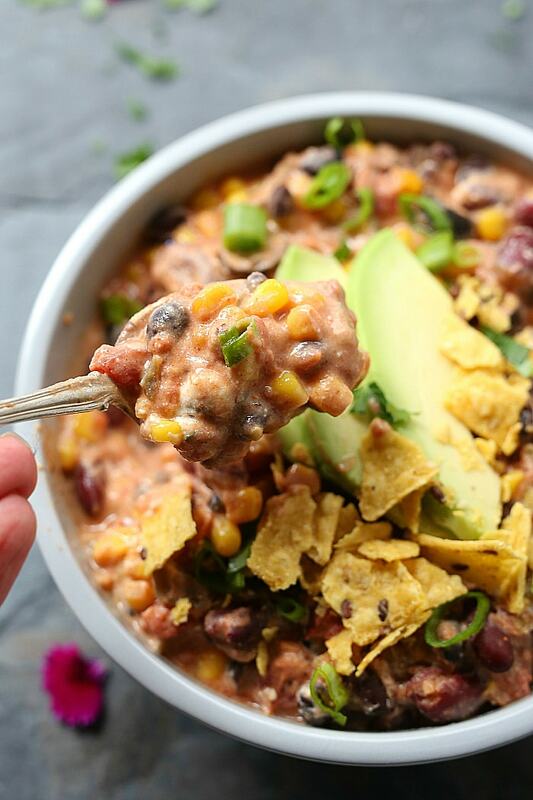 Use leftover taco soup as chili and turn it into chili nachos! Serve leftovers in tacos or burritos with extra shredding cheese on top. Fill a gluten-free tortilla with leftovers, roll into burritos and bake them in a casserole dish with enchilada sauce and shredded cheese on top. 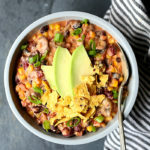 Can I make Creamy Taco Soup Without a Slow Cooker or Insta Pot? Yes! You can totally make this without a slow cooker or Insta Pot. You can make this on the stove top in as little as 30 minutes. Just simmer the ingredients, covered, for about 20-30 minutes. 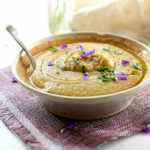 For a slow cooker cook for about 2-4 hours on low. For an Insta Pot set it to Soup and cook 10 minutes, lower pressure for 5 minutes, check it, stir and serve. 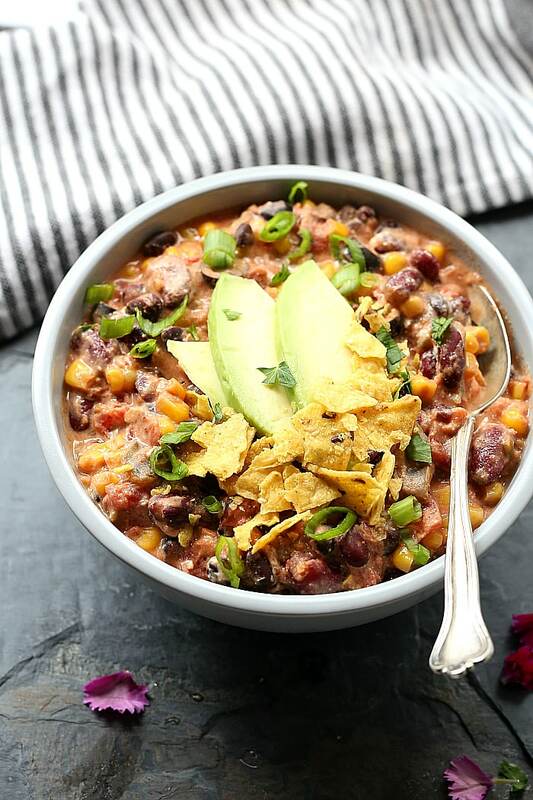 This taco chili soup is even more delicious as leftovers! This is one of our family favorite taco soup recipes. It uses canned kidney beans and black beans, olives, frozen corn, a box of diced organic tomatoes (or you can use canned), green chilies, whipped cream cheese (for less fat or use Greek Cream Cheese) and a pack of taco mix seasoning. 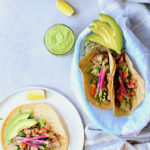 Super delicious garnished with crunchy tortilla chips, avocado and green onions plus easy as pie to make! Ooo speaking of pie – wouldn’t that be delicious with this afterwards?! Also, here is a little tip. You know those bags of tortilla chips that have a few leftover chips that are crumbled into pieces? I like to save those for on top of salads and soups. 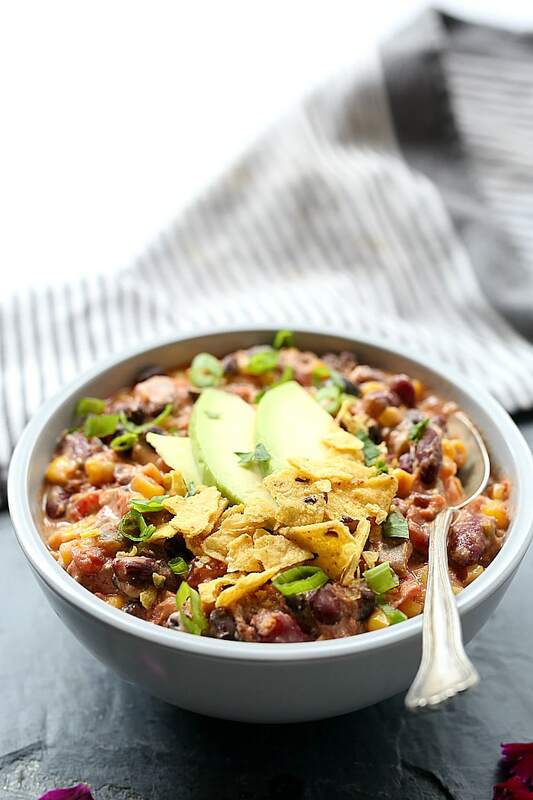 They make the perfect crunch additions to this taco soup! So don’t forget to save those remains that otherwise get discarded?. This vegetarian creamy taco soup is EASY, CREAMY, RICH, SILKY, SAVORY and MOUTHWATERING DELICIOUS! 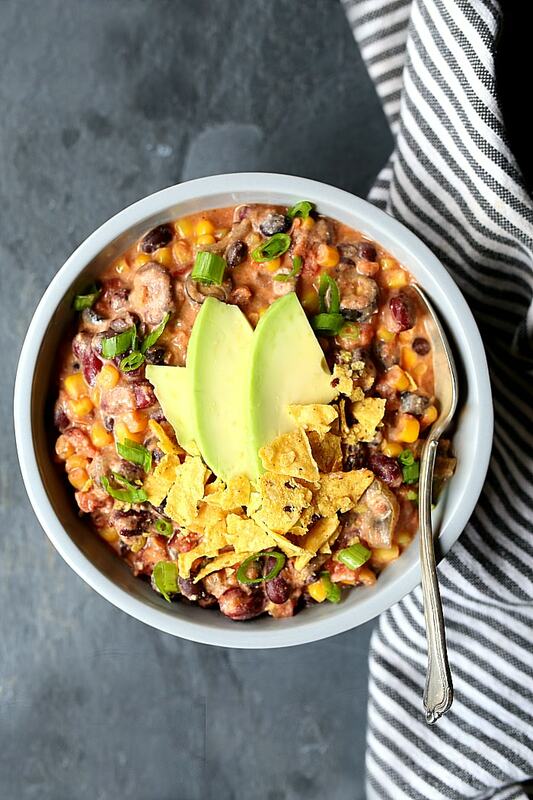 Pin This Creamy Vegetarian Taco Chili Soup! Creamy vegetarian taco soup to warm you up during the cooler months with tons of Mexican flavors! 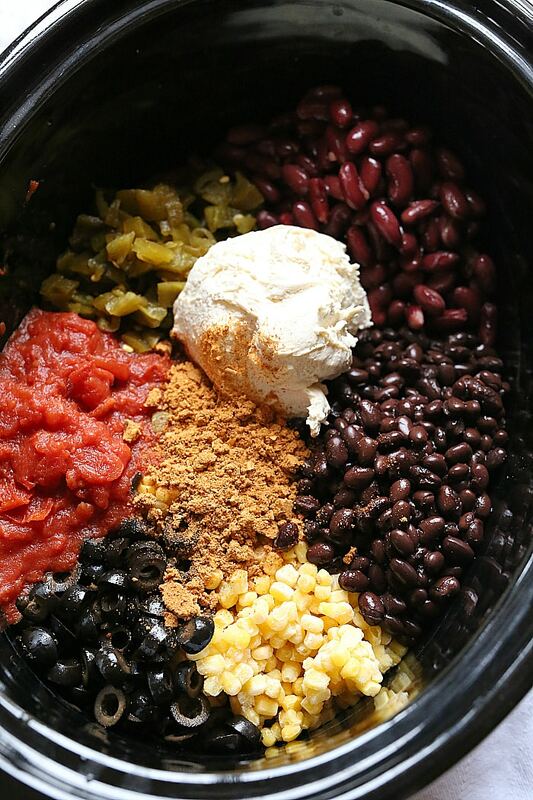 In a slow cooker add all the ingredients. Cover and cook on low for 2-4 hours. Stir halfway through. Add all the ingredients to a large pot. Cover and simmer on medium heat for 20-30 minutes until heated. Serve garnished with avocado, green onion and crushed tortilla chips (optional to add cilantro and sour cream too).